Well, I got out this morning, and started my running again. I still have plenty to get done today, but I fell like I am getting this moving in the right direction already. 1711 Calories, 11 g net carbs. Calories remaining 2126. I think this was the most deficit I have had haha. 11:35 PM to 6:59 AM. 7 hrs 5 mins. 12 x awake for 19 mins. I got to reading at 10:44 PM. Almost missed it. Started reading Book 3 of the Culture novels. Headed off to bed on time as well. I did great yesterday, and I am working on rolling it into today. Each day building on the last. Well, it has been another few days. I meant to get a blog post in before I left out for Thanksgiving, but just didn’t make it. The last couple of months have been a bit of a struggle, but I feel like I am breaking through it these last few weeks. Focusing on making sure I am in a decent calorie deficit has been helping. I have also been stepping up my walking game. 10,000 steps quite a few days recently. Not really much last week, as it was all time to get ready for Thanksgiving. We traveled down to my Sister-in-law’s place for Thanksgiving. I kept it Keto, even though it wasn’t easy. Of course we had turkey. We brought a Honeybaked Spiral cut ham with us. Of course, that is like 5 carbs a serving from all that sugar. Still, that is pretty much what I ate. I had a few green beans. I brought some spicy pork rinds to snack on too since we were down there for a few days. Other meals I kept it pretty simple. Eggs and ham, I had eggs and sausage from McDonalds one meal. I did have one bite of cranberry sauce. I cut a piece of cheesecake and pumpkin pie for my wife too. I wanted a piece, but I settled for just having a small taste of what was left on the knife. That made me really want to eat something sweet after that. haha. I refrained though. I did have a few sips of wine over the couple of days as well. Just taste of ones they were all trying. Man, they were super sweet. I could see drinking a bunch of that. It was better just to avoid it. While I haven’t been making the progress I had really wanted, I have been doing pretty damn good this year. My biggest failure, was to gain all my weight back so fast. October 7th, 2014 I was 257.3 lbs (my lightest). September 21st, 2015 I was 385.2 lbs. 127.9 lbs gained in less then a year’s time. I floundered over the next 2 1/2 years or so, only getting to 367.6 lbs at the beginning of 2018. January 1st of this year was my time to get back at it. I wanted this to me my defining year. The year to help erase that horrible failure of a year. So far, I am doing it. AS of this morning, I am 265.1 lbs. 99.7 lbs gone this year. I still have a month to go. Can I get to my lightest weight ever? That is my goal. To help my with my goal if hitting that 257 mark, I am doing the final NerdFitness Challenge of the year. I got my thread up last night. Tateman – Finish of 2018 with a Bang! I am taking on many goals this challenge. Much of which, I have done over this last year. I had worked on my deficit tracking last challenge. I did have a few days of 1000+ calorie deficit. I should be able to hit that 1000 calorie deficit each day with the help of working out, running, and walking. 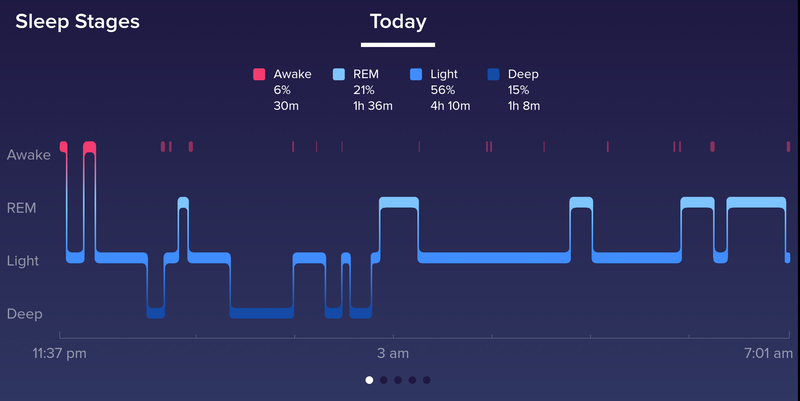 Sleep/Rest is super important too. If I am doing all this extra movement, I for sure need to make sure I get the rest and recovery I need to keep at it. I’ve also been back about keeping the blog updated. So I am working that into my challenge. The Linux course is mostly for fun. Plus learning. I really want to see if I think it would be a good fit for me to pursue as a career choice. I started to apply for a bit of work. One job would be 12 hours shits running 3 days one week, 4 days the next. I did this kind of shift a long time ago, and loved it. Of course, that was before two kids and 20 years later haha. Money is tight though, so I really need to get out there and work again. If I get sometime soonish, I will probably have to re adjust my goals to fit in the new schedule. Still excited to try. Wow oh wow. It has been so long since I blogged. It’s one of those I’ll get it tomorrow. Then that turns into 3 or 4 weeks later. Just to update. I am still going Keto strong. I have been participating in my NerdFitness goals still. Though, I haven’t posted there as often as I wanted too as well. I hope to fix this all as well. I have been struggling still to lose weight, though maybe I might have started breaking that plateau. The basic idea is to make sure I am at a deficit for the day. I am shooting for a >500 calories deficit. Though this week, I had a few more over eating days. Work in progress. November 2nd was my birthday. I turned 45. He needs to work on that form! He had a blast. It was really fun getting to be down there for it. Then next night, it was time for more hockey! This time the San Jose Sharks Star Wars night. I’ve felt that tracking my food has always been a big help to me. It is amazing to see how small a serving size it when you are lookign at packaged items. Back in the day, I’d have a Stoffer’s frozen lasagna all to myself. Then see on the back that it is 4 servings per package. Things like that, let me know I need to track. Maybe one day, I will feel more comfortable seeing my portions sizes, but I just like weighing things, and tracking them. I’ve been using MyFitnessPal for a really long time. I have made a switch though. I am now using Chronometer full time. I don’t get to share out my daily food diary though. But it does have some nice features. It has very specific numbers to show things like b vitamins that you get. Down to 269.6 lbs. 95.2 lbs gone this year. I pretty much struggled all last month with weight. This week though, I lost 2.7 lbs. I feel like I am making the break through again. So damn close to that 100 lbs lost number. Feels like it is taking so long! haha. Past few weeks, I have been stepping up my walking game. With my NerdFitness Challenge, I have been trying to increase step amount each week. 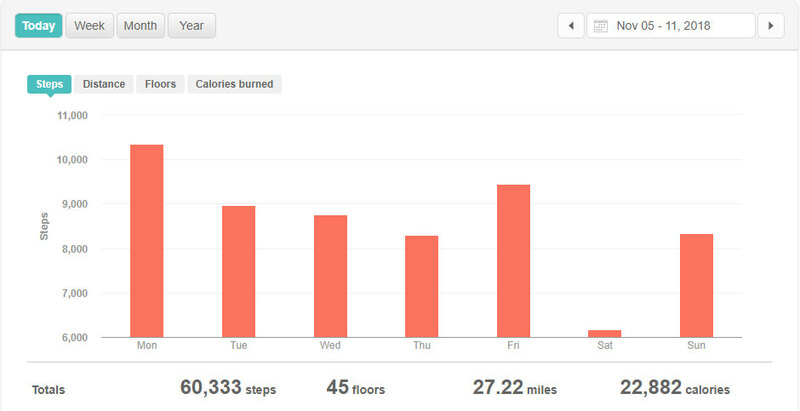 This last week, I was shooting for 7,000 steps per day. I am giving myself one day off. 11/05 – 10349 steps. 60 active minutes. 11/06 – 8960 steps. 78 active minutes. 11/07 – 8752 steps. 69 active minutes. 11/08 – 8302 steps. 43 active minutes. 11/09 – 9453 steps. 85 active minutes. 11/10 – 6172 steps. 44 active minutes. 11/11 – 8345 steps. 77 active minutes. I almost did the 7,000 steps every day this week. My one day off was still over 6,000. This coming week, I am shooting for 10,000 steps per day. I’m going to have to really work for it! I had some decent start to working out. Mostly body weight, and some dumbbell stuff. Recently though, it has been a fail. The last week, and this coming week, my sin is on minimum days. Parent teachers conference and all that. In an effort to save some money on Gas, I am saying there around the area while my kid is in school. On benefit is I am getting my walking in. One downfall, is that I haven’t been getting any kind of workouts done. I hope to do at least something this week. No school today, but I have been busy. OK, the real challenge for the year is coming. Thanksgiving, and Christmas for me. This time of year seems to be all the holidays though. I’ve decided for myself, that I will remain Keto. This next week, I have a couple of recipes to try for a sweet potato replacement, and possibly a pie. We are going out of town for Thanksgiving, so I might have to bring a few things just for me. Turkey should be fine, I just have to ignore other items. Then there is Christmas. We do like to have our sweets here too. I am sure we will have a Honey Baked Ham. So there will be sugars there. It just means I need to watch the portions closely. Then I might just need a few keto deserts to hold me over while others have normal cookies and candies. It’s just good to start preparing for things like this. I don’t want to be caught in emergency mode of no planning. Much easier to give in that way.